We opened the shop here in Kitty Hawk in the Spring of 2003. Our goal to provide our customers with professional, friendly service and quality rental equipment. 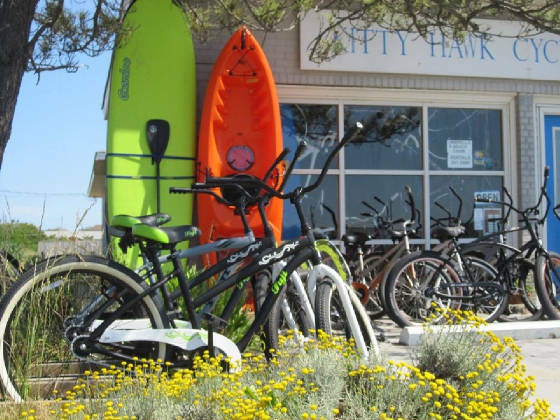 Our rental offering includes bikes for the whole family, kayaks,SUP,surf and body boards, beach chairs and umbrellas. In 2011, we took a giant leap and opened our sister rental store Duck Cycle located in the heart of Duck. After 15 years at our beloved Eckner Street location, the building was recently sold for redevelopment. With limited options for relocation, we decided to take the business online as a delivery only rental company. Our goal remains the same- to provide our customers with the best service and rental equipment at a great price. While we will miss seeing all of our longtime customers, please know that we are just a phone call away! We thank you for your business throughout the years, and look forward to serving you in the future.